It's you versus the clock, and a whole lotta demons. Bloody Palace is the perfect playground for Devil May Cry 5's trio of demon hunters. Enemies spawn into a circular arena, you kill them as quickly and stylishly as possible, and then jump through a portal in the floor to move into the next room. The mode removes all barriers between you and DMC5's juicy combat system. I almost wish the main game was this direct: no chatting, only demon-splatting. 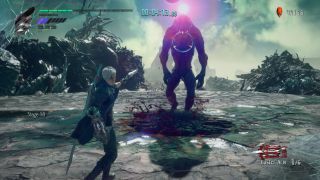 The mode has been an important part of the series since Devil May Cry 2. It functions as an endgame if you want to demonstrate complete mastery of every character's moveset, or if you want to quickly mine some orbs to unlock every skill in the game. In its best moments, Bloody Palace throws a horde of fodder at you, with a few tough top-tier villains sprinkled into the crowd. You get the satisfaction of eviscerating the weak adds while while navigating the tougher minibosses at the same time, all without taking a hit. When it goes well, Bloody Palace makes you feel like a god. This edition of the mode comes with Devil May Cry 4's ticking countdown clock. Beating rooms restores the clock and you can boost the time returned by avoiding all damage. Leftover time generates bonus orbs too, which means you're encouraged to blast up through the style ranks as efficiently as possible. You progress floor by floor rather than choosing between elemental portals a la DMC3: Special Edition. It's fun, but not perfect. I find it a little slow to get going. What's the point in having a bunch of floors I can clear with a couple of swipes with Nero's activated Tomboy form? I'd rather start with a challenging horde and work up from there. You can practice any floor that you've reached in 'warm up' mode, but to reach new floors you have to play through all of the old ones again first. Bloody Palace also exposes the limitations of V's moveset compared to Dante and Nero. His demons easily chew through the first 20 missions, but start getting one-shot by bigger enemies that start turning up after that. It's amusing to walk V around the edge of the arena reading a book while his demon pets regenerate, but it's not exactly fun. Nero and Dante are brilliant though. Every ten levels Nero enters an arena full of robot arms so you can keep restocking and changing up your loadout to match the enemies coming up in the order. Bloody Palace gives you more useful, concentrated combat time than the main campaign, which makes it a good place to learn weapons and test combos, especially in 'warm up' where you can get stuck into a big horde of insects on, say, stage ten, and get a guaranteed level of intensity from the encounter. Speaking of which, it's good to see villains like Furies get more screen time than they do in the first playthrough of the main campaign. I'd recommend beating the first playthrough before starting Bloody Palace because it mixes in elite enemies with the chaff you see in the first few missions. Every ten floors you will get a boss, too, and it would be a shame to ruin those by bumping into them without context. I've only reached level 27 after dabbling with the mode today, but I'm looking forward to seeing what's lurking in the higher tiers and watching the inevitable wave of gifs and videos from Devil May Cry masters. The Bloody Palace is another solid addition to one of the best brawlers on PC.